Deliver High Definition Audio from your CD, DVD, Blu-Ray, Computer, Video game console to your Stereo Receiver Amplifier or Headphones. Automatically Converts Toslink optical, Coaxial SPDIF Digital Audio or USB audio to Analog Stereo Audio (Red and White) Jacks or 3.5mm Headphone Jack. We make it easy with our Digital to Analog Audio converter to take a digital signal and convert it to play on existing audio and video products that don't offer Digital inputs. Easily Convert audio to L/R analog audio or 3.5mm Stereo Headphones Jack-- without additional costly equipment! Please note this will NOT convert Dolby. Our Digital to Analog Decoder takes audio encoded Digital Signal from your multichannel S/PDIF or TOSLINK digital audio source and converts it to L/R ( Red and White Jack ) analog audio -- without the need for any other external equipment! 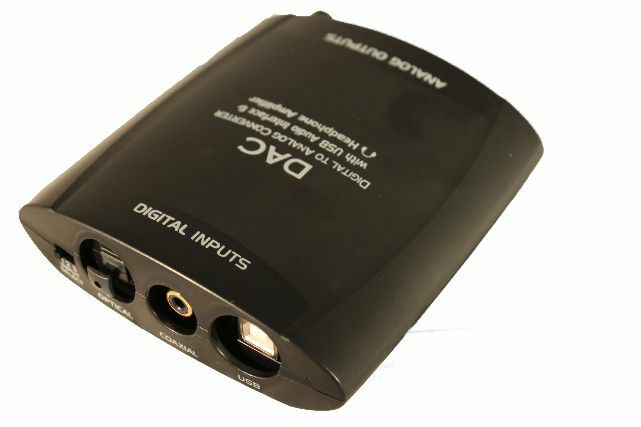 You plug the coaxial spdif, Toslink optical or a USB output on your digital audio source connects into the input on this Digital to Analog Decoder. Just plug in either a Coaxial ( spdif ) cable or a Toslink ( optical ) cable or USB to the input side. The Decoder is connected to the included power supply. Analog RCA ( Red and White RCA Cables ) connectors on the Decoder output L/R analog audio to your stereo or input of your device or you can plug in headphones to the 3.5mm Jack. This type of device is also know as a D to A converter or Digital to Analog Conveter. Simply run a short extension cable from an available digital audio output jack on your digital source device to the same type of digital input on the Converter. Then hook up your analog RCA-style left and right ( red white ) cables to the Converter's analog RCA jack outputs and plug in the converter and power up all equipment. That's it your done! Please note Audio installation cables are not included. Note: This a one way directional digital to analog converter. Q. Will this device convert Dolby Digital? A. 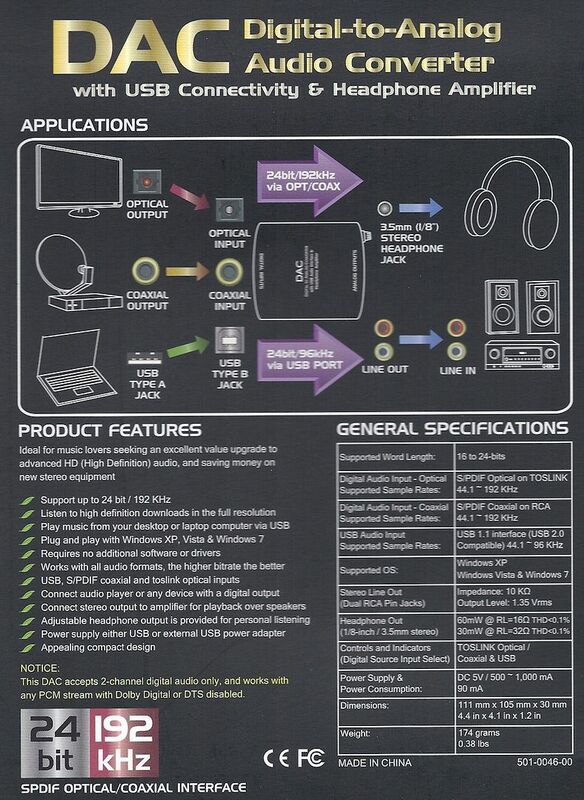 NO it will not convert Dolby Digital but on a lot of products you can change the settings. Let me explain. The most common problem we have seen is a change in setting on your device your trying to decode. As advertised this device converts LPCM is Linear Pulse Code Modulation, which is a method of encoding audio information digitally. Sometimes we have seen that customer have their systems set to Dolby Digital. This setting must be changed on the device your trying to convert. Most of DVD players and other devices support LPCM or other setting. You need to get into the menu of the device and adjust Dolby Digital to LPCM or other by using Remote control in most cases. 3 Ft. Toslink Digital Audio Cable - With our cables you get performance from connector to connector without the high prices.